For new parents, seeing their baby hospitalised is a nightmare scenario. But since 2013 this situation has been avoided for thousands of families due to the introduction of the rotavirus vaccine. Rotavirus is a common cause of vomiting & diarrhoea in children under five, which prior to vaccination was responsible for thousands of hospitalisations every year. Have you heard of ‘The Green Book’? Thousands of health professionals certainly have, as our guide to vaccines and vaccination procedures is one of the most popular pages on PHE’s website receiving well over half a million page views in the last year. 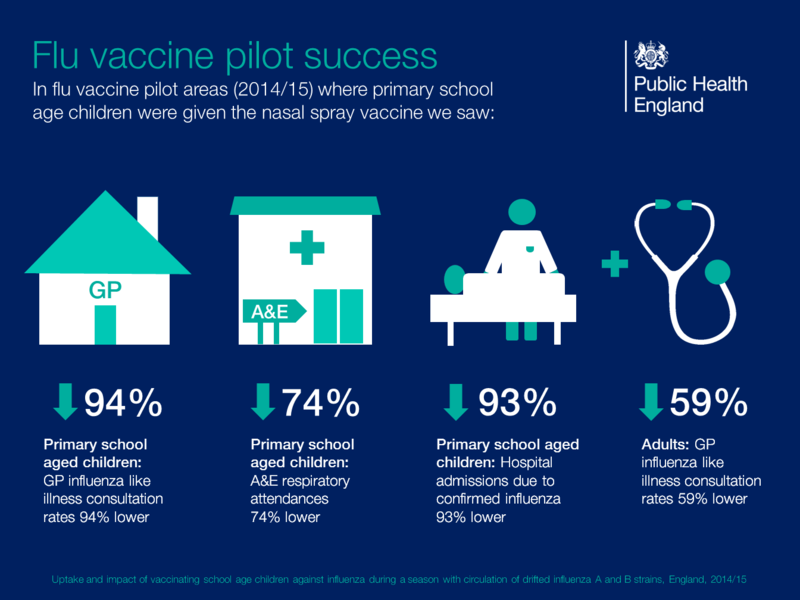 A pilot programme last year showed vaccinating children against flu had dual benefit; as well as protecting them it protects others, such as parents, grandparents and siblings. 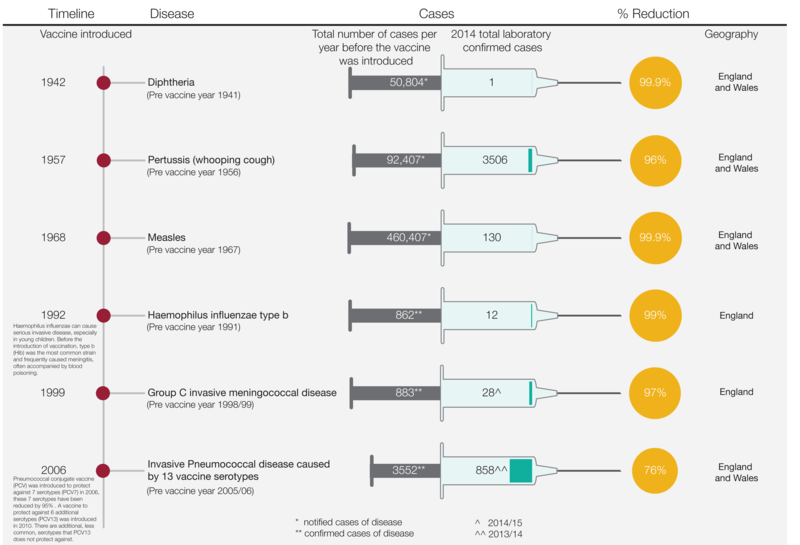 via PHE Data week: Immunisation in numbers – 5 fascinating facts | Public health matters. Objective Adverse event studies often use patient record review as a way to assess patient safety. As this is a time-consuming method, hospitals often study inpatient deaths. In this article we will assess whether this offers a representative view of the occurrence of adverse events in comparison to patients who are discharged while still living. Design Retrospective patient record review study. Setting and participants A total of 11 949 hospital admissions; 50% of inpatient deaths; the other half of patients discharged while alive. The data originated from our two national adverse event studies in 2004 and 2008. Main outcome measures Overall adverse events and preventable adverse events in inpatient deaths, and in admissions of patients discharged alive. We looked at size, preventability, clinical process and type of adverse events. Results Patients who died in hospital were on an average older, had a longer length of stay, were more often urgently admitted and were less often admitted to a surgical unit. We found twice as many adverse events and preventable adverse events in inpatient deaths than in patients discharged alive. Consistent with the differences in patient characteristics, preventable adverse events in inpatient deaths were proportionally less and were often related to the surgical process. Most types of adverse events and preventable adverse events occur in inpatient deaths as well as in patients discharged alive; however, these occur more often in inpatient deaths and are differently distributed. Conclusions Reviewing patient records of inpatient deaths is more efficient in identifying preventable AEs than reviewing records of those discharged alive. Although many of the same types of adverse events are found, it does not offer a representative view of the number or type of adverse events. via Is researching adverse events in hospital deaths a good way to describe patient safety in hospitals: a retrospective patient record review study — Baines et al. 5 (7) — BMJ Open. Prescribing of antibiotics has fallen steadily over the past five years in England, but the gap in prescribing levels between the least and most deprived areas is widening, a new analysis indicates. via Antibiotic prescribing is higher in deprived areas of England | The BMJ. NHS England has published a “quick guide” to making use of community pharmacy in urgent care. The guide is aimed at system resilience groups and commissioners. This document provides practical tips and case studies for System Resilience Groups and local commissioners showing how to extend the role of community pharmacy to relieve pressure on urgent care and how to make best use of the tools such as the Directory of Services, NHS Choices and the Summary Care Record to support this. 7. Helping people understand new medicines and changes to medication (especially on discharge from hospital). via Guide to using community pharmacy in urgent care — NHS Networks. via Homeopathy on prescription could be banned from NHS | Life and style | The Guardian. The King’s Fund has published Mental health under pressure. This briefing paper aims to focus on mental health as a system of care, examining individual pressures within the wider context of provider and commissioner actions. It draws together information from a number of different sources, providing a particular insight into provision and quality in order to provide an overview of the state of mental health services and care in England. This paper focuses on services for adults between the ages of 16 and 65.